GDS Holdings management often refer to the Chinese company as being the leading carrier-neutral data center operator in the country. Today, it would be hard to find many investors who’d dispute that claim. Over the past 12 months, its shares on Nasdaq have risen 280 percent. 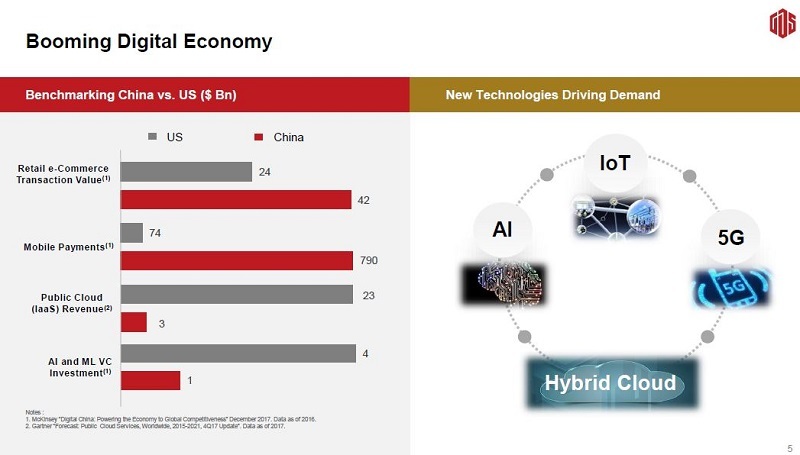 Its investors are betting on continued growth China’s digital economy and on the company’s ability to sustain the growth trajectory it’s been on since its US IPO in November 2016. GDS has met their expectations so far. The company recently reported 110 percent EBITDA growth for 2017. The amount of “in-service” GDS data center capacity increased by a whopping 66 percent last year. Its ramp-up of newly constructed data center deliveries accelerated in Q4 2017, when over 250,000 square feet was added, compared with about 184,000 square feet added in the first nine months of 2017. Notably, the GDS data center fleet contained about 1.09 million square feet in service at the end of last year, and another 430,000 square feet is currently under construction. GDS has continued strong leasing by leveraging its existing relationships with the top e-commerce and internet companies doing business in China. Compared to the US, China leads in e-commerce and mobile payments revenue by a significant margin. Adoption of public cloud (IaaS) is a different story. Data from a Gartner study in the GDS earnings presentation pegs US public cloud spend last year at $23 billion, compared with just $3 billion in China. This implies a tremendous runway for public cloud adoption as a percentage of IT spend in China going forward. In prepared remarks on the Q4 earnings call, GDS founder and CEO William Huang said, "In our view, the optimal business model for the data center industry is to serve high-volume cloud and internet companies colocated with high-value enterprises. GDS is already there." GDS is a data center provider for Alibaba, Tencent, Baidu, Di Di, and all the other logos shown below. It has grown the number of enterprise customers by 30 percent over the past three years, Huang said. Close association between state-owned enterprises and the commercial sector in China make for a complex market for outsiders looking in. It’s often challenging for foreign companies and investment analysts to fully comprehend these relationships, making it extremely difficult to properly value them. 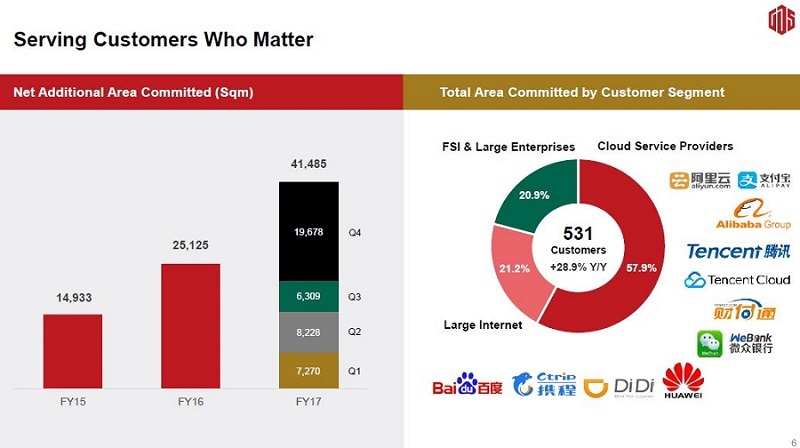 GDS kicked off 2018, for example, by announcing data center partnerships with the State Development Investment Corporation (SDIC), which is China’s largest state-owned investment company; with China United Network Communications (China Unicom), and with China Telecommunications Corp. (China Telecom), both top-ten global telecom companies. SDIC’s recent credit upgrade helps put things in perspective. In April 2017, Moody's Investor Service in one fell swoop gave the corporation first-time A1 rating -- a five-notch credit-rating increase. SDIC manages a large portfolio of investment funds for central and local government agencies. In total, SDIC wholly owns or controls 154 enterprises that are tier-3 or above. Six of them are public companies, including SDIC Power Holding, according to the company’s website. There appears to be minimal credit risk associated with hyper-scale leases signed with SDIC entities, making these public/private partnerships even more precious. GDS is primarily focused on developing data center campuses in China's Tier 1 markets. However, it intends to leverage the ubiquity of China Unicom, China Telecom and SDIC to serve Tier 2 markets in the country on a build-to-suit basis. The first of three 100-percent committed 54,000-square foot data centers to be built in Hebei (HB1), considered a Tier 2 market, will be delivered by the end of June. HB2 and HB3 are also underway, both scheduled for completion by year-end. Clearly, these partnerships existed for many months prior to the formal announcement in January and will begin paying dividends for investors in 2018 and beyond. The relatively opaque nature of the digital economy on the other side of the Great Firewall of China presents many challenges for US investors. But due diligence by a well-known third party has made a dramatic difference in investor sentiment. In a surprise announcement last October (just one year after the GDS IPO), CyrusOne and GDS announced a strategic partnership. The deal appears to have put the opportunity on the map for US investors. A vetting by one of the largest publicly traded US data center REITs in the form of a $100 million investment in GDS became a catalyst for a meteoric rise in GDS shares. In January, Credit Suisse downgraded GDS to Underperform (Sell) from Neutral (Hold), with a $23.10 price objective. GDS briefly traded down to $20.00 per share prior to bouncing back up. In December 2017, RBC analyst Jonathan Atkin raised his price target for GDS to $26.00 per share. On January 18, GDS floated a follow-on share offering of 8.225 million shares at $26.00 per share. It appears that RBC's view of GDS share performance has most closely matched actual performance of the stock price. 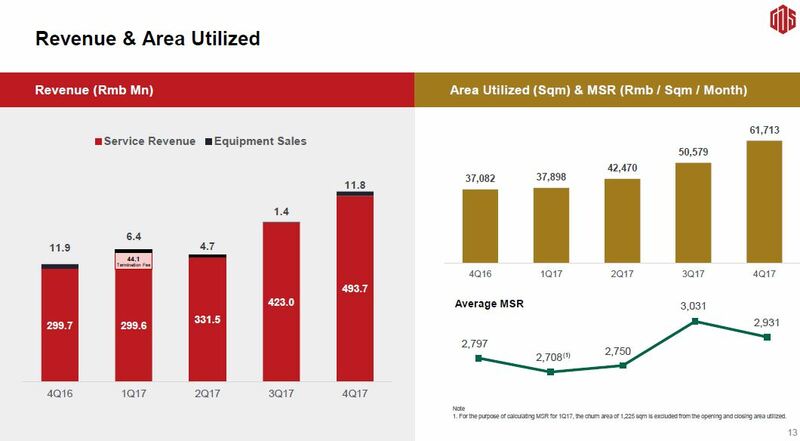 On March 15, Atkin reiterated an Outperform (Buy) rating after GDS reported Q4 2017 results and boosted his price objective to $33.00. 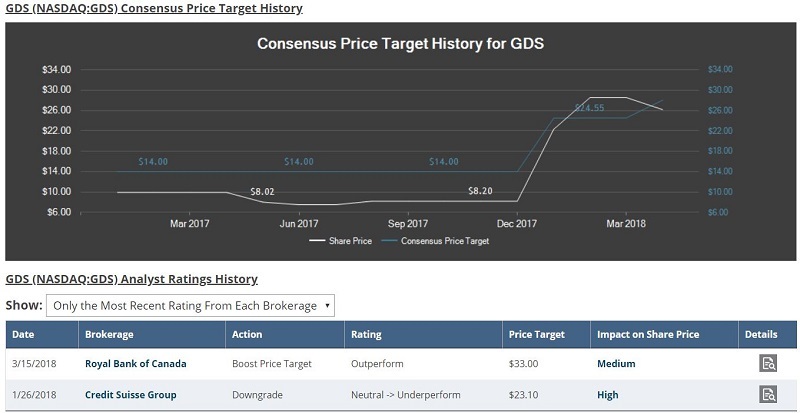 Subsequent to the time of writing, Marketbeat added JPMorgan Chase's Outperform rating for GDS with a PT raised to $31 from $21 to its analyst coverage. The exponential growth of the GDS data center fleet presents a Catch 22 for investors and analysts. The rapid construction reduces the overall portfolio utilization rate, which negatively impacts margins. Asked for an estimate of the time lag between data center delivery and occupancy on the earnings call, GDS CFO Daniel Newman said the contracts often give customers flexibility for 12 to 18 months. But the company doesn't forecast based on that timeframe, because a typical data center client doesn't occupy the entirety of the space they take down on day one. That usually takes four to five quarters, he said. Notably, GDS does not pay a dividend on the Nasdaq-traded shares. Investors appear focused on the top-line revenue growth potential – much like technology companies are often viewed. This gives GDS management more flexibility to invest in growth than publicly traded US REITs have, since they must distribute at least 90 percent of taxable income to shareholders. Any potential competitor will face a high barrier to entry into GDS’s market. Existing GDS customers drive high-double-digit growth, and the company is adding new enterprise logos rapidly, while expanding its portfolio. Gartner data underscores that the recent public cloud deployments in China are just the tip of the spear. Eager buyers looking to diversify and take advantage of China’s growth runway have bid up GDS shares more than 100 percent in just the past few months. Technically, GDS’s Nasdaq-listed equity is in the form of American Depository Shares, or ADS, with each ADS equivalent to eight GDS common shares. However, I doubt many US investors are concerned with those details when the stock has performed so well after CyrusOne’s investment. The momentum has made GDS the bitcoin of data center stocks – its shares often swing in the 5 to 10 percent range in a single day. I expect the pattern of irrational exuberance one day and profit-taking the next day to continue. Such extreme volatility, combined with GDS’s exponential price appreciation, makes it challenging for long-term investors to find an entry point. But given the pace of growth, waiting too long to hop aboard the GDS bandwagon might become a regrettable decision. Note: the conversion between RMB and the USD used in the GDS presentation was 6.5 to 1.